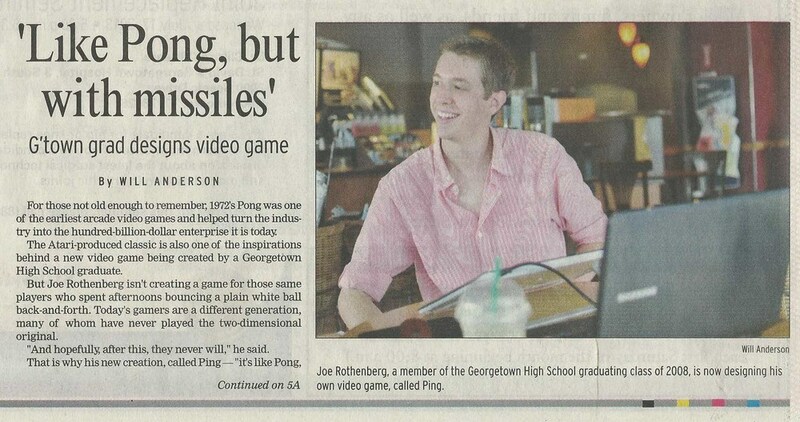 Last week my hometown paper, the Williamson County Sun, ran an article about Ping on the front page! 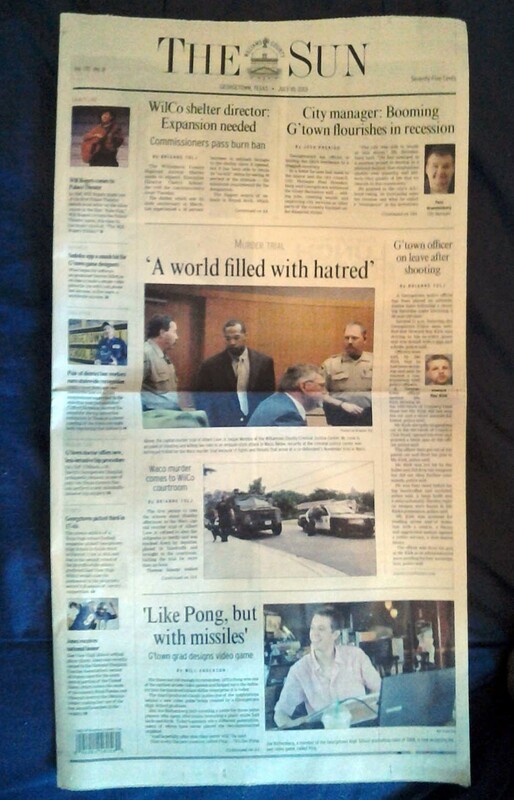 I guess Ping is a positive counterbalance to the neighboring article entitled "A world filled with hatred." Anyway, I really like the article and I hope you do too. Many thanks to my friend Lorraine for making this possible. And I gotta say thanks to everyone in Georgetown for always making me feel welcome whenever I'm in town. PING PRO TIP: You can steer your Super Shot by moving up or down after firing. This is called a Super Shot Spread. For those not old enough to remember, 1972's Pong was one of the earliest arcade video games and helped turn the industry into the hundred-billion-dollar enterprise it is today. The Atari-produced classic is also one of the inspirations behind a new video game being created by a Georgetown High School graduate. But Joe Rothenberg isn't creating a game for those same players who spent afternoons bouncing a plain white ball back-and-forth. Today's gamers are a different generation, many of whom have never played the two-dimensional original. "And hopefully, after this, they never will," he said. That is why his new creation, called Ping — "its like Pong, but with missiles," Mr. Rothenberg explained — features interactive backgrounds in a kaleidoscope of colors, different power-ups and the ability to play by yourself against the computer or versus a friend. The game is tentatively set to debut in August and a free demo is already available on the projects website, pingth­egame.com. The 23-year-old was born and raised in Georgetown and graduated from George­town High School in 2008. He attended the School of Cinematic Arts at the Uni­versity of Southern Califor­nia in Los Angeles, finish­ing in 2012 with a degree in animation. His knack for design and drawing stretches back even further, to when Mr. Rothen­berg was drawing cartoons for the Sun from 2003 to 2005. He also started his own business in high school, running a video game-design camp in the summer break between classes. "Those three mediums have always interacted simultaneously for me," Mr. Rothenberg said, referring to drawing, animating and vid­eo game design. "They work off each other and I go back and forth between them." When he created the An­imation in Video Games Summer Camp with friend Austin Tompkins in 2003, Mr. Rothenberg was only 13 years old. Many of the attendees were older and in higher-level courses at the high school. "But we were taller so we didn't tell anyone how old we were," he said. "It was kind of tough that first year." In college, Mr. Rothenberg began making animated mov­ies and interned at Platinum Studios in Santa Monica, Cal­ifornia, from 2010 to 2011. His 2012 movie "Ladies Knight" won an award from the Columbus Internation­al Film+Video Festival that year and was named the best ­animation at the Orlando Film Festival. Now Mr Rothenberg is preparing to publish his first game. Instead of trying to work for a major design studio, where new hires are often delegated to low-level quality assurance work or forced into a niche of expertise, Mr. Rothenberg decided to forge his own path as a designer, where he would have creative control and also be able to fully flourish in his multiple disciplines, he said. With the help of a pair of composers and a number of producers, things are proceeding on schedule. The game is about 80 percent complete, Mr. Rothenberg said. Setting up a version of Ping on his laptop on a recent afternoon, the young entrepreneur explained the rules of the game and how to play. "It's pretty intuitive," he said. "You'll get it really quickly." He sat down, elbows on his knees, and watched. Control was out of his hands for once, but Mr Rothenberg did not seem to mind. Posted on July 13, 2013 by Joe Rothenberg. It's been quiet around Ping headquarters for the past 2 weeks while I visited Texas for my sister's wedding. The wedding was a happy one (it was indoors) and it was great to see friends and family. I also got the chance to show Ping around, and rumor has it there will be an article about Ping in my hometown paper (where I worked as a cartoonist years ago). Would that I could be with my family all the time, but tomorrow I return to Burbank -- triumphantly, of course -- to buckle down on Ping with rekindled passion. Next up I'll be working on a Ping trailer to help promote the game, then it'll be finishing & polishing the game until the cows come home. Which will be in August. PING PRO TIP: When firing a Super Shot, press and HOLD the shoot button to condense the Super Shot into a powerful Mega Bullet. Yall come back now, y'hear? Posted on July 9, 2013 by Joe Rothenberg. Well, it took about a week longer than expected, but I finally got the browser demo working. Now Mac users can play! The browser demo still has a few quirks and tends to lag sometimes, but I'll keep working on fixes and updates. The downloadable demo is still the best choice for PC users. In other news, this site had a record-breaking 835 unique viewers last week! Woohoo! Thank you all for all the visits! Let's see if we can beat that this week! PING PRO TIP: Did you know that you can get a speed boost by double-tapping up or down? Posted on June 24, 2013 by Joe Rothenberg.